Former retailer John Lovell was the face of Silks Jewellers for 25 Years. Since retiring and selling their business last year, John and Peggy have moved to the beachside suburb of Orewa in northern Auckland. – Since moving to Kensington Park in Orewa, have you missed your former neighbourhood? We have wonderful memories of that time, but we wanted to downsize within Auckland and as Orewa is only 45mins away, we can still see our friends regularly. Life is a book with many chapters, and we have started a new chapter a short stroll from the beach. – Do you miss the buzz of business, regular customers and Howick village [in East Auckland] itself? Yes, after so many years in Howick we do miss the interaction of our regular customers, and the stimulation of the business, but not the long retail hours on our feet, and the never-ending dusting, cleaning and polishing of all the stock. Howick village to us was the Jewel of the East… now, Orewa is our Jewel by the Sea. – What type of home have you moved into? Is it an apartment, standalone villa or what? Kensington Park has all of those but we chose a two-bedroom apartment with a sunny perspective and generous living space. As it was brand new, Peggy was able to decorate it in a fabulous, light and airy coastal style which we love. It was far easier to downsize than we expected. – What is it that you like about life in Kensington Park? How liberal is your lifestyle? Are there any restriction on what you can do? With more than 600 residents living here there’s real sense of community. Being freehold you get a good mix of residents from all walks of life and ages who take pride in their properties and have a vested interest in ensuring the place always looks great. A quarter of the 40 acres has been allocated to beautiful landscaping and recreation areas and a residents’ association is responsible for their upkeep. This means all the stunning gardens are well cared for. When it comes to the social side, it’s like living in a resort – no time restrictions – where people are having fun. We like Orewa beach, which is only a six minute stroll away, and the town centre which is also an easy walk – nice shops, lots of cafes, restaurants, pubs and two supermarkets. Alice Eaves Reserve with walking tracks, is also nearby; great for those with dogs. – Is there anything you would like initiated at Kensington Park? We already have fabulous facilities with the heated pool, gym and sauna – there’s even veggie gardens and orchards. I think a community hall or indoor space, which could be used for hobbies, music, pilates and family functions, would be a great asset. – Do you still do work within your own profession? Of course, having been in jewellery all my life it is part of me and I’m always interested in new design and developments. I can assist family and friends but I find myself taken up with other interests now. – How active are you in the Kensington Park community? Quite active within my own building as I am on the Body Corp committee and also help organise social activities within our group, it’s easy to become involved with all sorts of things and it’s fun! – Have you taken up new interests of hobbies? Yes, keeping fit, playing Mah Jong and planning our next trip. We just lock up and go. I have also started helping in the Kensington Park office to promote the park from a resident’s perspective, so most weekends I can be found in the sales suite talking to people about life here…it’s exciting describing all the good things on offer. – What about Peggy – has she taken up new interests, do you share the same hobbies? 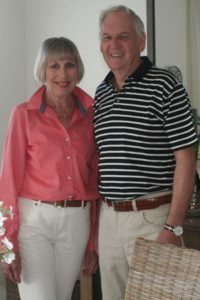 Peg and I worked together for more than 50 years so we are used to doing things together. For Peg it was an easy transition to have me around. Obviously we still share a lot of activities, but she now has time to enjoy singing, cooking, reading, meeting with friends, walking the beach and also making new friends. We both have time to enjoy the theatre, shows and travel. – These days people live longer than in the past so are retirement resorts/villages attracting younger retirees? There are no age restrictions at Kensington Park as it’s not a retirement village, but it has all the great lifestyle benefits of being one i.e. it’s safe, secure and well maintained. I’m not sure on the breakdown but there is certainly a mix of ages here. The attractiveness of the lock and up leave idea is certainly not limited to retirees. I think the coastal location, design and structure of the park appeals to a large cross section of people, some of whom I know as they have come from Howick. – If you could ask any three people to dinner living or dead who would they be and why?